“Emotional debt,” occurs whenever one party feels beholden to another (I owe you), or another party feels entitled (you owe me). Emotional debt is a part of every relationship and can knit people closer together or tear them apart. Unresolved emotional debt results when obligations become burdens and entitlements become traps. It shows up in anger, resentment, guilt, and remorse and it can wreak havoc on your relationships, ruin your health, control your life, and cause endless suffering. Emotional debt may become so pervasive you manage all your relationships based upon fulfilling obligations or expecting obligations to be fulfilled. If unchecked, it can result in one or both parties becoming isolated and stuck. At its worst, a relationship may become emotionally bankrupt, ending in a bitter divorce battle or, sadly, in cruelty and violence. You owe it to yourself to understand what emotional debt is, how you create or agree to it, and how you can release yourself from those debts that burden you. 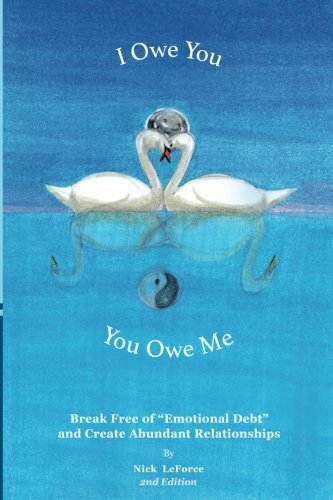 I Owe You, You Owe Me will help you find the keys to freedom, to love, and to living a fuller life. Of all the work that I have done in the field of NLP over the past 30 plus years, the contribution of “emotional debt” is, in my opinion, the best that I’ve offered. It has served, for me, as an essential concept and practical pattern for resolving relationship issues in my own life and I have used it in almost every coaching session since formulating the idea. It provides a powerful conceptual framework for understanding the interpersonal dynamics that either strengthen or weaken relationships, and that are often at the heart of relationship challenges and breakdown. It explains the troubles and triumphs that occur between people, groups, and even nations, as well as the sticking points in our own relationship with ourselves, with life, and with whatever we might call God or spirit.